While it may be true that some species are more exciting to find than others, usually due to their rarity or beauty, it is also important to record common and ordinary wildlife too. Every piece of information helps to build up a better understanding of the natural world in which we live, and can also help direct conservation efforts and steer new development away from sensitive areas. Species distribution and abundance is constantly changing, and global warming and living landscapes will also affect what is where. So, in a nutshell, every record is useful! The first five items are required for all types of record, but the "Nature of record" will vary according to the wildlife being recorded. For mammals it could be fur, prints, adults, a sett, a road kill, a spraint, etc. 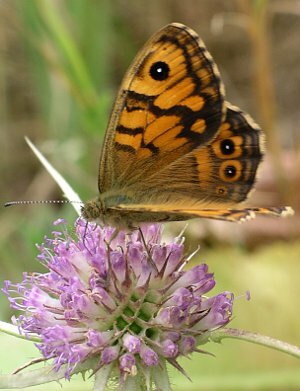 For butterflies it may be the quantity of adults, eggs, larva, pupa, etc. And so on for other groups. Reports about wildlife should be sent to the appropriate County Recorder. A County Recorder is a unpaid volunteer that has been appointed to keep records of a particular group of wildlife within the county. They tend to specialize in one or two groups only, so depending upon what was seen, the reports may need to go to different people. If you aren't too sure of what you have seen, contact them anyway, and they may be able to help with its identification. We all have to learn to identify wildlife and most naturalists are only too happy to share their knowledge with others. Since the County Recorders are best equipped to advise on what is important to report for their group, we won't do so here. They can also advise on what to look for, where and when, and if help is needed for a particular project, so please don't be afraid to contact them. They will welcome any help you can give and will be happy to talk to you about their speciality. The full set of the current County Recorders can be found on the Bedfordshire Natural History Society (BNHS) website, in the Contacts section. The BRMC obtains most of its data through these Recorders, so by sending your records to them they will in turn become available to us here at the BRMC. That website also carries some standard forms preferred by the Recorders for submitting records. While they are usually happy to accept records in any intelligible format, by using their preferred forms this greatly aids their processing of data which can amount to tens of thousands of records per year! We have provided here a simple Example Records Template spreadsheet that can be used to get you started. By sorting by the species group you can easily order your records for sending to the individual County Recorders. Adnoto - Simple forms for many species groups, run by the BNHS. As well as containing lots of interesting info about Bedfordshire's wildlife, the BNHS website also carries an article about recording that may also help, and also a very useful tool called Grab a Grid Reference which makes it very easy to obtain a grid reference for a record.